How best to oppose fascism and populism? A lesson of history is that the left needs unity and democracy in order to win. Unite the Right rally, Charlottesville, VA. USA TODAY Network/PA Images. All rights reserved.The Nazi killing of a protester at Charlottesville, and the president’s subsequent equivocation about racist violence, reveal the contrast between Trumpism in power and its predecessors. Such incidents and statements, and there have been many more, raise the question of the resilience of American democracy. How much authoritarian populism can the system withstand without turning into dictatorship? In this article, we suggest that one answer might be found in looking at the nature and history of resistance to fascism and populism in the past. New studies show that fascism and populism in government were successful when relied on their ability to keep support by mixing coercion and demagoguery. But they also succeed when the opposition was divided and the population became apathetic and politically disengaged. Trump fomented such divisions after Charlottesville by distributing blame for violence between the Nazis and the "Antifa" movement, and was echoed by others who sought to depict anti-fascism as just another form of totalitarianism. These politicised reactions are not surprising, but they present a genuine challenge: to what extent successful resistance to these governments requires coalitions of political parties, labour movements, and other mass organisations. Some would argue that an approach of this kind is too slow, and that countering the rise of fascism of the kind encouraged by the Trump government should embrace the active resistance and defensive violence that anarchists, communists and punks have long embraced in Europe against neo-Nazis. 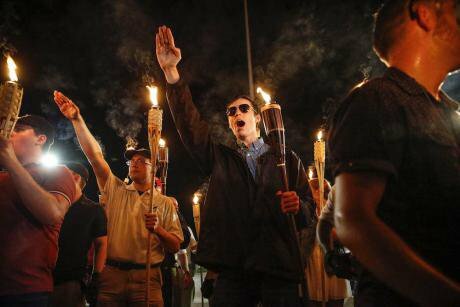 There is evidence that this combative stance can deter public displays similar to the shameful "tiki-torch" march of Charlottesville. But fuller historical evidence casts doubt on this partisan approach. For one thing, its emphasis on local struggles neglects the true historical lessons of anti-fascism, when it was the unity of diverse social forces, often leading to electoral coalitions – rather than small and hyper-engaged groups – which confined fascism to the margins. For another, the approach is premised on the idea that constitutional democracy is inherently powerless in fighting fascism. But there are legacies of struggle, notably in Latin America, which advanced by using legal and public tools rather than counter-violence. The general lesson here is that protest without a political framework tends to be less effective. History can offer a different, less biased lesson. The rise of fascism, its global attacks against democracy and its disastrous military adventures inspired much discussion among liberals and socialists across the world on the origins of fascism since the 1930s until today. There was no easy explanation then for why exactly fascism emerged and all of a sudden reshaped the political landscape. In a few days, Hitler enacted extreme discrimination, abolished civil rights of minorities, and eventually was able to engineer the closing of parliament. In fascist Italy, after the opposition symbolically left parliament in protest of the assassination of an opposition leader, Mussolini soon established a fascist dictatorship. While it is not possible to single out one factor that would explain the emergence of white supremacism, neo-Nazism and extreme-right populism in the United States and Europe in recent years, there is an increasing consensus among historians and social scientists that Trump’s political approach shares many aspects of the language, goals and political logic of populism as well as important connections to the genealogy of populism in fascism. In turn this historical interpretation rests on making connections, both between different historical periods and between fascism and populism, whose genealogies are entwined. After 1945, populism reformulated fascism in terms of a new authoritarian and anti-liberal democracy. The presidencies of Brazil's Getulio Vargas and Argentina's Juan Perón are examples, more recently is Venezuela's Nicolas Maduro. The Trump administration's blitzkrieg of decrees in its first year, breaking with decades-old provisions, betrays a similar political logic. In explaining fascism in the first half of the 20th century and populism in the second half, it was necessary to understand their emotional and mythical forms, their language and spectacle, their leadership and ideology, which for a time convinced people in a way that more rational or programmatic choices did not. In many cases, effective anti-fascism contributed to the creation of a new democratic context. In the inter-war years, most leftist parties and other anti-fascist organisations eventually embraced a "popular front" strategy, where electoral, military and labour forces collaborations across ideological divides. This allowed communist parties to enter the political mainstream and influence social policies in, for example, Mexico, Chile, and France. In the United States, the New Deal incorporated forces and claims long part of the left. Trade unions, with support from governments, were able to negotiate for better salaries and working conditions. By contrast, the failure of popular fronts in Germany, Italy and Spain helped pave the way for fascism's victory, and in Argentina after 1945 allowed Perón's populist regime to consolidate. In Germany, the massive working-class demonstrations that tried to prevent Hitler’s appointment as chancellor in 1933 failed to alter the course of Weimar’s fragmented political landscape or build a parliamentary coalition that would stop the rise of Nazis. In Italy, the left abandoned parliamentary politics in 1924, facilitating Mussolini’s repression and building of a fascist institutional framework. It was the failure of the left to form a strong coalition in republican Spain before 1936 that paved the way for Franco’s victory. Popular fronts were always criticised from both left and right, with mutual demonisation (communists vs socialists or anarchists, liberals vs conservatives).The gains of communists seemed short-lived once the Molotov-Ribbentrop non-aggression pact of 1939 changed the Soviet Union’s strategy toward Germany, and Stalinism forced communist parties to return to the sectarian strategies they had embraced before the popular-front period. The new geopolitics of the cold war created more fractures. In Europe, anti-fascism became a myth with little purchase on the present, as liberalism cared little about reaching out to its former left-wing allies. In Latin America, populism replaced fascism as the enemy of liberals and leftists, but some former anti-fascists supported authoritarian governments and military coups rather than take a democratic route. The Argentine communist party’s tolerance of the 1976 military junta (for pro-Soviet reasons), and the Venezuelan’s opposition support for a coup against Hugo Chávez in 2002, are examples. If some parts of the emancipatory and anti-racist dimensions of popular-front politics were lost to mainstream political discourse, others survived in a marginal way in various left-wing groups. Spain during the post-Franco transition to democracy, where resistance to the Falange and European fascism was a source of legitimacy for communists and anarchists rejoining the state, was one instance; Cuba's revolution and socialism after 1959, which linked anti-imperialism with left-wing mobilisation while also recalling the bonds between Latin America and the Spanish civil war, was another. A similar nostalgia is present in responses to Trump's administration. This history is relevant by underlining how a divided opposition can enable fascist and populist regimes to reinforce their power. The old factionalism of liberal and leftist organisations has too often proved counterproductive. The courage of anti-fascist groups today is a reminder that mobilisation and collective imagination are needed to defend democracy. But besides the heroism of small groups in the streets, the importance of the ballot-box and the halls of congress as places of resistance should not be forgotten.